Right said Fred……. – Dirty wet dog , boats and sailing. “Have to take the wall down….that there (bathroom) wall is gonna have to go ! The good new on day 2 of the project is that we haven’t had to take the bathroom wall down but we have now trashed just about every room in the house either because we have had to remove something to get at something else or just covered the place in a combination of plaster dust and god knows what that has fallen through the bathroom ceiling. It was my mistake to think that the really dirty work was over once i had got the bulk of the tiles and old plaster board out and then pulled down the false ceiling. By the end of yesterday my dust suit was all but unrecognisable and even with a good quality respirator on i was still sneezing black snot this morning. Matt the plumber claimed to have had 2 showers last night before feeling vaguely clean. I haven’t done a job that dirty since crawling around the bilge of an old boat and even that didn’t produce this much dust. Yesterday as well we discovered more of the ‘Don-isms’ when we took the waste pipes out from the shower, bath and basin. There has always been a bit of a wiff in the bathroom because we knew at least one of the fixtures didn’t have a trap so we had one point that is the vent for the whole sewer. In either heavy rain of cold high pressure air in the valley we reckon that the gas build up in the mains sewer vents via our bathroom so we sometimes have the extractor running continuously. When i took the shower tray, basin and remnants of the bath the smell in there was awesomely bad for a few hours. While i am thinking about those 3 we also noted that there was only a short drop under the shower into a common drain with the basin and bath and that ran exactly horizontally so stagnant water just sat there all the time. Today the best discovery was when we took out the soil pipe from the macerator which we knew ran horizontally across the living room ceiling…except that it wasn’t horizontal but went up a bit and had a big downward curve in the centre : you can imagine what that was like when Matt cut through it !. Today its been a slow and frustrating day trying to close the ceiling and one wall, we have the new ceiling boards up and 2 panels that form a short wall. The problem today was as expected that nothing is quite square so that although the verticals of the stud framing are just about true neither the floor or the ceiling are square and true to that so the first panel had to be a parallelogram and the second a rhomboid…..and of course it only rained when we were cutting boards outside. Yesterday was fun with the skip arriving and that gave the driver a very difficult half hour to get his lorry past an awkward neighbour’s car, then joggle into our drive. 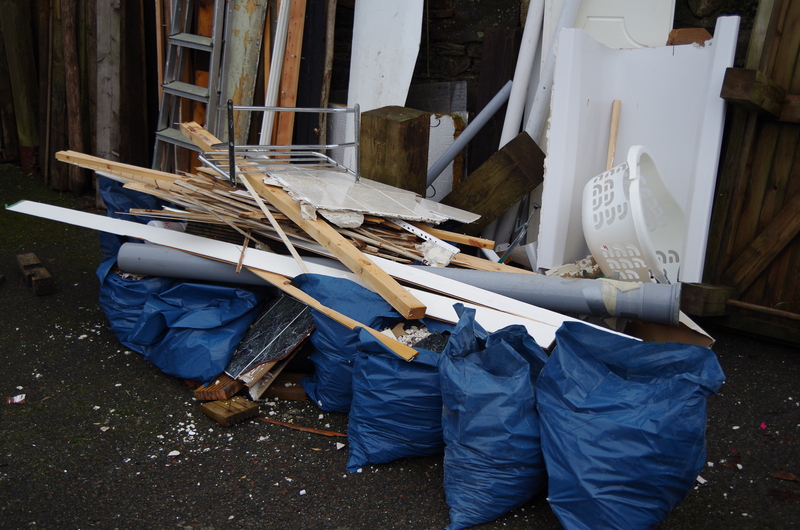 We just about filled the skip immediately with loose stuff with just about room for the bagged-up tile and plasterboard mix on top. Then the deliveries start arriving and yes it was flies and ointments as we started checking the order and one of the main components is wrong as it had been boxed up with the wrong colour label. What with deliveries and 2 tradesmens vans on site on a narrow lane we had the selfsame neighbour having a bit of a strop !. Next A thing of beauty. Ah that smell was probably reminiscent of a certain boats bilge ! I was once told that with plumbing only two things matter s:*^ does not go uphill and plumbers get paid on Friday. Sounds as though the geometry is fun. I spent hours in that bilge !